Aims: Oral squamous cell carcinoma (OSCC) primarily occurs in older age group. However, in the recent years, incidence of oral cancer in young people has been on rise worldwide. Towards this end, we sought to analyze the clinical and histopathological characteristics of OSCC in patients less than 45 years of age. Materials and Methods: The clinical and histological features of patients diagnosed with squamous cell carcinoma of the oral cavity at two hospitals in the coastal Karnataka region of South India between 1996-2012 were reviewed. The tabulation and descriptive statistics of the study were carried out. Results: A total of 420 patients were treated for OSCC in the 17-year period (1996-2012), of which 86 (20.5 %) patients were under 45 years of age. The most common site of involvement among the young was tongue (29.07%) and buccal mucosa (27.9%) respectively. 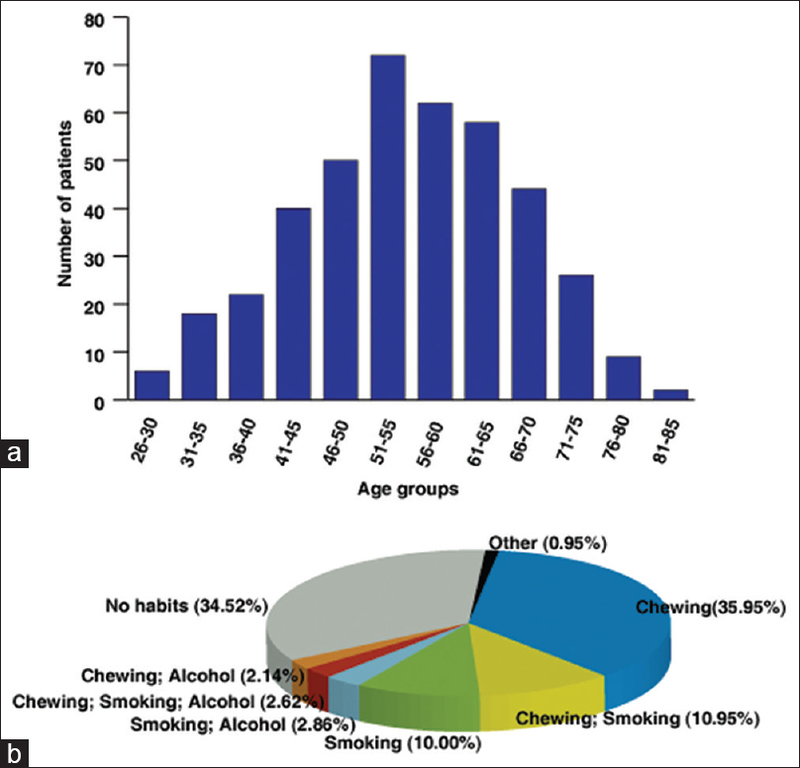 A total of 47 (54.65%) patients were either habitual chewers, smokers, or alcoholics. Pathological grading of cases classified tumors into well differentiated (34.88%), moderately differentiated (46.51%) and poorly differentiated (4.65%). Conclusions: The data from this study reveals that a significant proportion of the OSCC cases are observed in patients of 45 years or younger. Additionally, our study also indicated an increase in the usage of tobacco and pan chewing in young adults in comparison to older individuals in the two hospitals of South India. The data obtained from this analysis emphasizes the need for screening programs that are tailor-made for individuals at high risk of developing oral cancer and warrants tobacco awareness programs in the community. Oral squamous cell carcinoma (OSCC) ranks among the top three cancers in India and is the eighth most common cancer worldwide. OSCC primarily occurs in males in their 5th–8th decades of life. However, based on recent studies in Europe and the rest of the world, an increase in the incidence has been observed in younger adults including females with no history of tobacco or alcohol consumption. In India, OSCC remains a major public health concern where the consumption of tobacco in various forms is the cause of high prevalence. The use/consumption of tobacco in India varies in different geographical locations  with chewing of betel-quid with or without tobacco being the most common form. In the south coastal region of India, chewing pan, use of commercial tobacco products, beedi (local type of cigarette), cigarette-smoking, alcohol-drinking and use of snuff are some of the common habits. Among these, chewing pan is a fairly common social habit, particularly in the female population, as men smoke more often than chew tobacco. The consumption of tobacco is also disproportionate and is higher among lower socioeconomic strata of society. Several clinical studies around the world have focused on the occurrence of oral cancer in the young age group.,,,, In the Indian scenario, although several studies have focused on etiology and clinicopathological features of OSCC in the Indian population,,,, no previous studies have been conducted with reference to the incidence of OSCC in a younger age group in south coastal Karnataka. Although it is known that the incidence of oral cancer increases with age, there is an increasing trend of incidence in young males. A similar trend has also been observed in females who never consumed alcohol or tobacco. A rise in oral cancer incidence among younger adults has been reported in Europe , and rest of the world. This study is aimed to study the clinicopathological details about the demography, site predilection, tobacco-related habits/risk factors in younger SCC patients treated in coastal Karnataka region during a 17-year period. The case history and biopsy report files were retrieved from the archives of the hospitals in coastal Karnataka region from 1996 to 2012. 420 cases of OSCC were selected for the study. The data extracted from the 420 records were reviewed for clinical and histological features of OSCC. The study included pathologically confirmed cases of squamous cell carcinoma of the lip (ICD-10 site code C00), intraoral sites (ICD-10 C01– C06) and oropharynx/tonsil (ICD-10 C09 and C10). Patients with malignancies of the salivary glands, nasopharynx and hypopharynx and metastatic tumors were excluded from the study. Demographic data such as gender, age, family history of cancer, site of occurrence, tobacco smoking, alcohol consumption and tobacco chewing were obtained from patient records. In addition, details of the clinical staging and histopathological grading were obtained from histopathology records. Clinical staging of tumors was carried out using the 1992 tumor, node, metastasis (TNM) classification of malignant tumors. The tumors were histopathologically graded by cell differentiation into well differentiated, moderately differentiated and poorly differentiated categories as per the World Health Organization criteria. The tabulation and descriptive statistics of the study were carried out using GNU PSPP 1.0.1 (https://www.gnu.org/software/pspp/), an open source software for statistics. Chi-square test was carried out by the statistician to compare the descriptive statistics across cases (>45 and ≤45 years of age). A total of 420 cases diagnosed with OSCC between 1996 and 2012 were selected for the study. 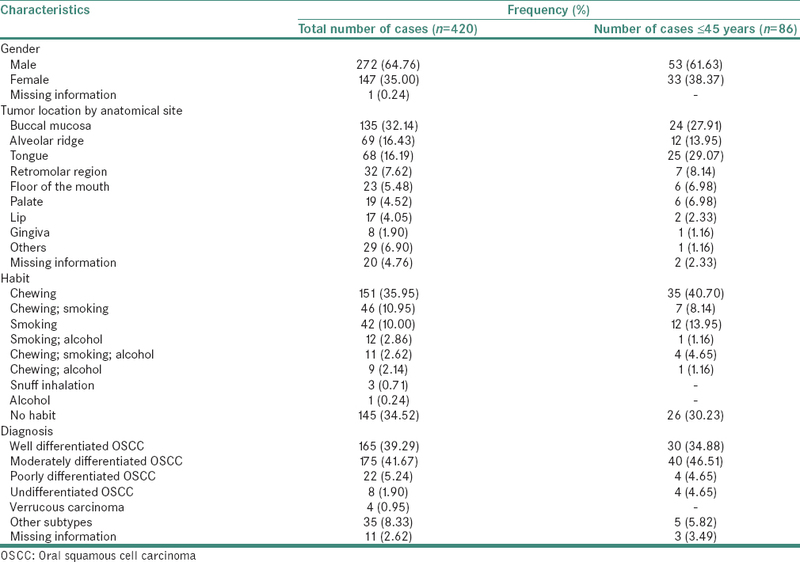 A summary of patient characteristics for these 420 oral cancer cases are provided in [Table 1]. Of the 420 cases, 272 were males (64.76%) and 147 were females (35%). Gender information was missing for one case. Age histogram analysis was performed for all OSCC cases [Figure 1]. OSCC cases that were within the bottom fifth percentile (<45 years) in the age histogram were considered as “young patients” while those exceeding >45 years were considered as “old patients.” 322 patients (76.67%) were categorized as >45 years of age while 86 patients (20.48%) were between 26 and 45 years with a mean age of 60.4 years and 39.62 years, respectively. Age-related information was missing for 12 cases. A comparison of descriptive statistics between young and old patients is depicted in [Table 2]. Classification based on tumor localization revealed predominantly tumor of the buccal mucosa (32.1%) followed by an alveolar ridge (16.43%) and tongue (16.19%). 289 (71.1%), 277 (65.9%) and 224 (53.3%) of the OSCC cases had details about tumor stage, nodal status and metastasis, respectively. Using this information, TNM staging was carried out for 219 (52.1%) cases. Of these, 166 (39.52%) were assigned to Stage III, 30 (7.14%) to Stage IV, 12 (2.86%) to Stage II and 11 (2.62%) to Stage I, respectively. A summary of TNM classification and staging of all OSCC cases analyzed is provided in [Table 3]. Based on differentiation state, the OSCC cases were classified into well differentiated (39.29%), moderately differentiated (41.67%) and poorly differentiated (5.24%) cancer. Information was missing for the rest of the cases. Of the total cases, 217 (51.66%) patients had a history of tobacco chewing with or without smoking or alcohol consumption. 111 (26.43) of the 420 patients smoked while 33 (7.86%) patients consumed alcohol. 145 (34.52%) patients had no reported habits [Table 4]. The chewing habits composed mainly of tobacco, pan and betel nut. Tobacco chewers constituted 33.33% of a total number of cases and 64.51% of all chewers. Pan chewers constituted 9.76% of a total number of cases and 18.89% of all chewers. Betel nut chewers constituted 8.57% of a total number of cases and 16.58% of all chewers. 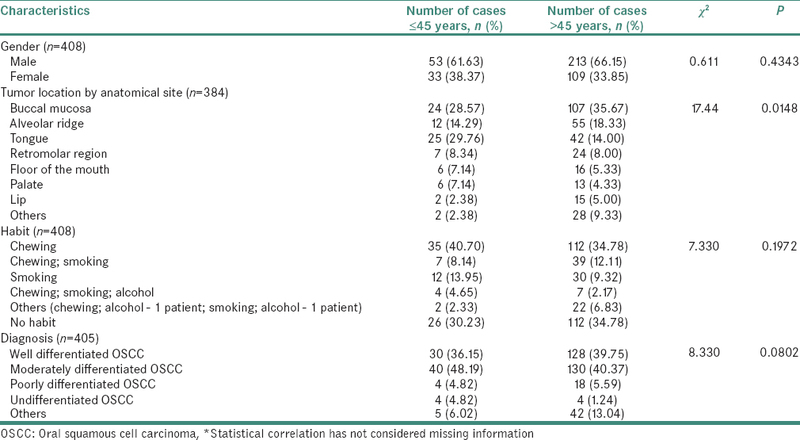 Of the 420 cases, 86 patients (20.48%) were between 26 and 45 years of age with a mean age of 39.62 years. A summary of patient characteristics for OSCC diagnosed in the young is provided in [Table 1] and [Figure 2]. These cases consisted of 53 males (61.63%) and 33 Females (38.37%). Tumors for the 86 cases [Table 1] were found to be localized predominantly to the tongue (29.07%), buccal mucosa (27.91%), and alveolar ridge (13.95%). 62 (72.09%), 50 (58.1%) and 40 (46.5%) of the 86 cases had tumor stage related information, nodal status and metastasis details, respectively. 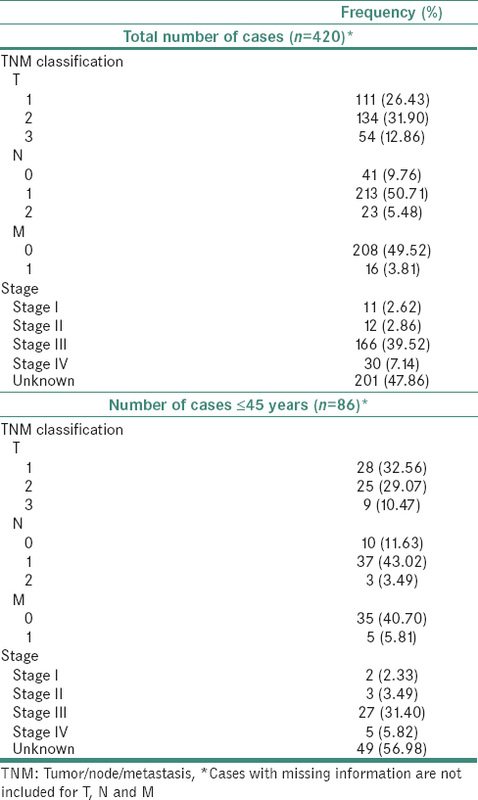 Using this information, TNM staging was carried out for 37 (43%) of the total number of cases. Of these, 27 (31.4%) were assigned to Stage III, 5 (5.82%) to Stage IV, 3 (3.49%) to Stage II and 2 (2.33%) to Stage I, respectively. Information was missing for the rest of the cases. A summary of TNM staging of all oral squamous cell carcinoma cases is provided in [Table 2]. Based on differentiation state, 86 cases were classified into well differentiated (34.88%), moderately differentiated (46.51%) and poorly differentiated (4.65%) OSCC [Table 1]. Verrucous and undifferentiated carcinomas represented 10% of cases. Information was missing for the three of the cases. Of the total cases, 47 (54.65%) patients had a history of tobacco chewing either alone or in combination with smoking or alcohol consumption. 24 (27.9%) of the 86 patients smoked while 6 (6.97%) patients consumed alcohol. 26 (30.2%) patients had no reported habits [Table 4]. Tobacco chewers constituted 36.04% of a total number of cases and 65.95% of all chewers. Pan chewers constituted 13.95% of a total number of cases and 25.53% of all chewers. 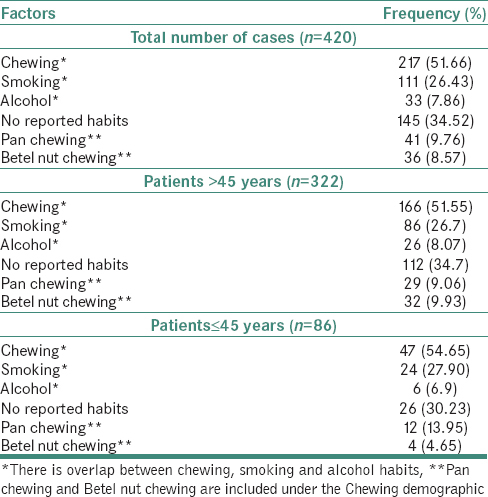 Betel nut chewers constituted 4.65% of a total number of cases and 8.5% of all chewers. OSCC is a major health problem in regions of the world where tobacco habits in the form of chewing and/or smoking with or without alcohol intake are common. The increasing consumption of tobacco has become a multidimensional problem and a threat to the health of the youth in India. Several key factors are responsible for the regular use of tobacco by the youth including exposure to parental, sibling and peer smoking, peer group pressure, easy access to smoking and nonsmoking forms of tobacco, aggressive promotion and advertising, low cost among others. The primary objective of this study was to carry out the clinicopathological analysis of oral cancer in young adults (<45 years). We determined the cut-off age of 45 years using a previously described method. This was done by drawing an age histogram for all OSCC patients [Figure 1]a. The cases within the bottom fifth percentile (<45 years) in the age histogram were considered as “young patients” while those exceeding >45 years were considered as “old patients.” This was in accordance with criteria described in previous studies.,, The age range observed in the present study was 26–45 years with a mean age of 39.62 years. In general, oral cancer occurs more frequently in males than females in all age groups. Our data corroborate with the existing literature with males (64.76%) more commonly affected in comparison to females (35.00%). This was also found to be true in the case of young adults where 61.63% of the diagnosed cases were males while 38.37% were females. Analysis based on tumor localization revealed tongue (29%) as the most common site of involvement among young patients. Our results are consistent with previous reports of rising incidence of oral cancer in younger patients, particularly on the tongue. Buccal mucosa (27.91%) was the next common site of involvement followed by the alveolar ridge (13.95%). Our findings corroborate with data obtained in other studies involving younger patients of OSCC.,,,, In India, 50% of oral cancers have been reported in the buccal mucosal region, whereas in several western countries the same was reported to be as only 5% without age differentials. The use of betel quid in India has been associated with the high incidence of squamous cell carcinoma. This may be due to the fact that the quid is generally placed in the cheek pouch and is in direct contact with the buccal mucosa. However, the length of time of contact with the tar and nicotine products in the tobacco smoke and tobacco quid serves as the crucial factor in causation of cancer at particular anatomic site. Further studies are imperative to elucidate the mechanisms of the development of carcinoma of the tongue as it appears to the common cause of cancer among younger individuals with or without known risk factors such as tobacco habits. Most patients in our study were diagnosed in the advanced stages of the disease with 39.52% of the total patients diagnosed with Stage III and 7.1% of the patients diagnosed with Stage IV. Our results corroborate with the findings reported in other studies., Among the patients of ≤45 years, 31.40% were diagnosed with Stage III, and 5.82% were diagnosed with Stage IV. Different groups have reported varied results in this regard.,, These results suggest a patient delay in doctor consultation. Previous studies have documented such delays and linked it to advanced stages of oral cancer., The TNM staging could be performed for only half of the samples as several samples in our study had missing annotation for information such as tumor status, nodal status, metastasis and familial history. Nonavailability of data can partly be attributed to noncooperation from the patients, missing data from case history. Careful, controlled documentation of the patient history is essential for research. Establishment of a biobanking facility along with systematic electronic tabulation of metadata associated with samples could help mitigate these problems. Rising number of OSCC in younger group reflects the need for revision of conventional preventive programs for oral cancer. In our study, the characteristics of OSCC in young patients did not differ from the OSCC seen in the overall population. Common risk factors such as tobacco and alcohol consumption were observed in most of the patients. The absence of traditional factors in a small proportion of younger patients needs to be further evaluated using a larger cohort. Other risk factors including influence of environmental carcinogens, stress and viral infections also need to be evaluated. Previous studies have reported human papillomavirus (HPV) infection as a significant risk factor in the development of oropharyngeal squamous cell carcinoma, especially in patients who do not smoke or drink. However, assays to assess HPV infection are not performed routinely in several hospitals in India. In the current study, no information on HPV status was available from archives. In addition, familial history of cancer has previously been studied as a possible risk factor for oral cancer. The onset of cancer of early age has been suggested as an indicator of hereditary cancer and also found the higher familial risks for the same site of cancer in first-degree relative if the index cancer was diagnosed in younger age. We found that there was no evidence of the familial history of cancer in our retrospective study. The results of this study indicate that a significant proportion of all OSCC cases are observed in patients of 45 years or younger. The study indicated an increase in tobacco and pan chewing in young adults when compared to older individuals in South India. We observed that majority of the cases in our study were in the advanced stages of the disease which suggests late clinical presentation and therefore a delay in the diagnosis of OSCC in the studied population, irrespective of the age. This necessitates the identification of potential biomarkers using high-throughput omics technologies and their application for large-scale screening in a cohort of multiple geographical locations. This study also exposes the limitations of immunohistochemical archives at Pathology departments including the lack of uniformly annotated information, missing TNM staging and grading information. Clinical staging of tumor cases could not be carried out for a large number of cases due to missing information. This emphasizes the need for a mechanism for methodical tabulation of patient metadata including electronic. Further, HPV status in OSCC samples could not be assessed as these are not routinely performed in hospitals. HPV assays should be established in all hospitals as part of a national program. Further, public awareness regarding the signs, symptoms and risk factors among the younger group patients, along with lack of knowledge for early detection by some health-care providers are believed to be responsible for this diagnostic delay and treatment initiation. Screening programs tailor-made for individuals at high risk of developing oral cancer including tobacco users are required for early and accurate diagnosis. In addition, the study also warrants awareness programs in the community regarding the risk habits and its detrimental effects. Aruna DS, Prasad KV, Shavi GR, Ariga J, Rajesh G, Krishna M, et al. Retrospective study on risk habits among oral cancer patients in Karnataka cancer therapy and research institute, Hubli, India. Asian Pac J Cancer Prev 2011;12:1561-6. Dikshit RP, Kanhere S. Tobacco habits and risk of lung, oropharyngeal and oral cavity cancer: A population-based case-control study in Bhopal, India. Int J Epidemiol 2000;29:609-14. Giovino GA, Henningfield JE, Tomar SL, Escobedo LG, Slade J. Epidemiology of tobacco use and dependence. Epidemiol Rev 1995;17:48-65. Chitapanarux I, Lorvidhaya V, Sittitrai P, Pattarasakulchai T, Tharavichitkul E, Sriuthaisiriwong P, et al. Oral cavity cancers at a young age: Analysis of patient, tumor and treatment characteristics in Chiang Mai university hospital. Oral Oncol 2006;42:83-8. Warnakulasuriya S, Mak V, Möller H. Oral cancer survival in young people in South East England. Oral Oncol 2007;43:982-6. Siriwardena BS, Tilakaratne A, Amaratunga EA, Tilakaratne WM. Demographic, aetiological and survival differences of oral squamous cell carcinoma in the young and the old in Sri Lanka. Oral Oncol 2006;42:831-6. Iamaroon A, Pattanaporn K, Pongsiriwet S, Wanachantararak S, Prapayasatok S, Jittidecharaks S, et al. Analysis of 587 cases of oral squamous cell carcinoma in Northern Thailand with a focus on young people. Int J Oral Maxillofac Surg 2004;33:84-8. Llewellyn CD, Linklater K, Bell J, Johnson NW, Warnakulasuriya KA. Squamous cell carcinoma of the oral cavity in patients aged 45 years and under: A descriptive analysis of 116 cases diagnosed in the South East of England from 1990 to 1997. Oral Oncol 2003;39:106-14. Sankaranarayanan R, Duffy SW, Day NE, Nair MK, Padmakumary G. A case-control investigation of cancer of the oral tongue and the floor of the mouth in Southern India. Int J Cancer 1989;44:617-21. Kuriakose M, Sankaranarayanan M, Nair MK, Cherian T, Sugar AW, Scully C, et al. Comparison of oral squamous cell carcinoma in younger and older patients in India. Eur J Cancer B Oral Oncol 1992;28B: 113-20. Macfarlane GJ, Boyle P, Scully C. Oral cancer in Scotland: Changing incidence and mortality. BMJ 1992;305:1121-3. Macfarlane GJ, Boyle P, Evstifeeva TV, Robertson C, Scully C. Rising trends of oral cancer mortality among males worldwide: The return of an old public health problem. Cancer Causes Control 1994;5:259-65. Sobin LH, Wittekind C; International Union Against Cancer. TNM Classification of Malignant Tumours. New York: J. Wiley; 1997. Wahi PN. Histological Typing of Oral and Oropharyngeal Tumours. Geneva: World Health Organization; 1971. Takatsu Y, Hiki N, Nunobe S, Ohashi M, Honda M, Yamaguchi T, et al. Clinicopathological features of gastric cancer in young patients. Gastric Cancer 2016;19:472-8. Singh MP, Misra S, Rathanaswamy SP, Gupta S, Tewari BN, Bhatt ML, et al. Clinical profile and epidemiological factors of oral cancer patients from North India. Natl J Maxillofac Surg 2015;6:21-4. Barra S, Franceschi S, Negri E, Talamini R, La Vecchia C. Type of alcoholic beverage and cancer of the oral cavity, pharynx and oesophagus in an Italian area with high wine consumption. Int J Cancer 1990;46:1017-20. Llewellyn CD, Linklater K, Bell J, Johnson NW, Warnakulasuriya S. An analysis of risk factors for oral cancer in young people: A case-control study. Oral Oncol 2004;40:304-13. Iype EM, Pandey M, Mathew A, Thomas G, Sebastian P, Nair MK, et al. Oral cancer among patients under the age of 35 years. J Postgrad Med 2001;47:171-6. Jayant K, Balakrishnan V, Sanghvi LD, Jussawalla DJ. 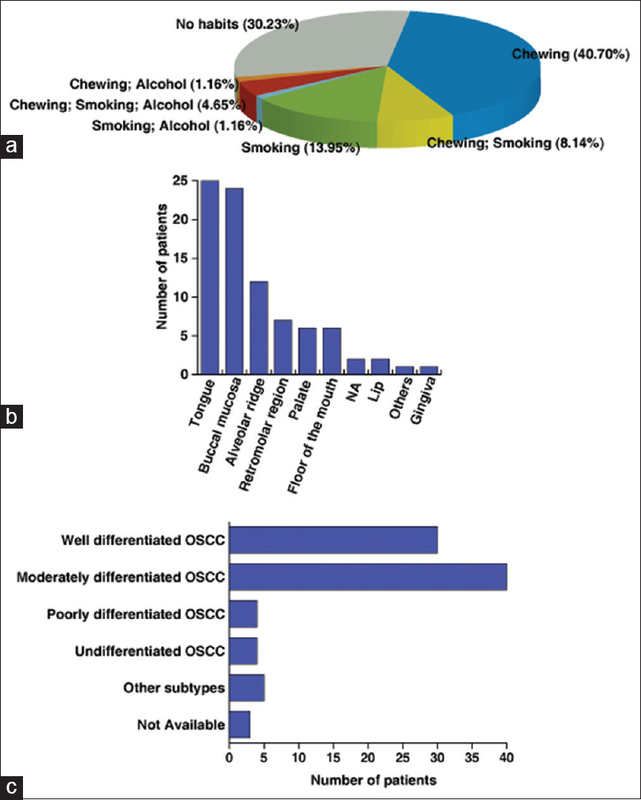 Quantification of the role of smoking and chewing tobacco in oral, pharyngeal, and oesophageal cancers. Br J Cancer 1977;35:232-5. Jussawalla DJ, Deshpande VA. Evaluation of cancer risk in tobacco chewers and smokers: An epidemiologic assessment. Cancer 1971;28:244-52. Gupta PC, Pindborg JJ, Mehta FS. Comparison of carcinogenicity of betel quid with and without tobacco: An epidemiological review. Ecol Dis 1982;1:213-9. Newman AN, Rice DH, Ossoff RH, Sisson GA. Carcinoma of the tongue in persons younger than 30 years of age. Arch Otolaryngol 1983;109:302-4. Sankaranarayanan R, Mohideen MN, Nair MK, Padmanabhan TK. Aetiology of oral cancer in patients less than or equal to 30 years of age. Br J Cancer 1989;59:439-40. Ribeiro AC, Silva AR, Simonato LE, Salzedas LM, Sundefeld ML, Soubhia AM, et al. Clinical and histopathological analysis of oral squamous cell carcinoma in young people: A descriptive study in Brazilians. Br J Oral Maxillofac Surg 2009;47:95-8. Kumar S, Heller RF, Pandey U, Tewari V, Bala N, Oanh KT, et al. Delay in presentation of oral cancer: A multifactor analytical study. Natl Med J India 2001;14:13-7. Kowalski LP, Franco EL, Torloni H, Fava AS, de Andrade Sobrinho J, Ramos G, et al. Lateness of diagnosis of oral and oropharyngeal carcinoma: Factors related to the tumour, the patient and health professionals. Eur J Cancer B Oral Oncol 1994;30B:167-73. Andrews E, Seaman WT, Webster-Cyriaque J. Oropharyngeal carcinoma in non-smokers and non-drinkers: A role for HPV. Oral Oncol 2009;45:486-91. Lynch HT, Fusaro RM, Lynch J. Hereditary cancer in adults. Cancer Detect Prev 1995;19:219-33.